New book, some shelf wear to cover. 310 pages. 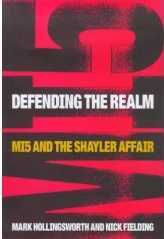 This book provides a rare glimpse into the the secret world of MI5. Packed with new anectdotes and information, this is an up-to-date insight into how officers are recruited, the running of agents, MI5 surveillance operations, how applicants are vetted for sensitive jobs, the secret files of the Registry, the endemic drinking culture and the peculiar obsession with bureaucracy. MI5 is running out of threats to national security. Faced with being frozen out of existence, it has desperately sought out new targets - like organised crime - areas normally reserved for the police. As MI5 is not a law-enforcement agency, the authors ask the ultimate question: do we still need to Security Service in its present form?